The Caves of Nerja are also known as the Natural Cathedral of Malaga, for its enormous natural vaults with stalactites. Those caves are an Asset of Cultural Interest and is part of Spain’s historical heritage, making it an interesting place to visit. I have decided to update the entry to encourage you to visit it or for learning together a little more about it; it is located in Nerja, a beautiful municipality on the eastern Costa del Sol. The Caves of Nerja are 800 metres from the coast and 158 metres above sea level. The formation of those caves is produced by the rainwater that dissolves the rock as it filters, a process that in this case originated more than 5 million years ago. Although the history of the Caves of Nerja is not as tragic and mysterious as that of the Treasure Cave in Rincon de la Victoria, it is also interesting and I will tell you about it. The galleries you can visit today were discovered in 1959. A group of young people went out to look for bats and decided to enter a narrow well after breaking one of the stalactites that prevented them from passing. 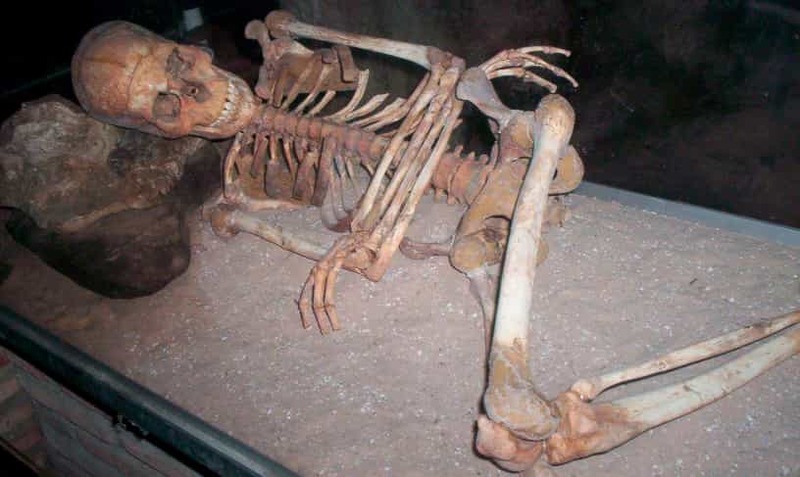 Once inside, they found remains of skeletons and ceramics; frightened and believing that they were contemporary corpses, they returned to tell what had happened. After the visit of a doctor and a photographer the importance of the place is confirmed and the discovery spreads internationally. The public inauguration of the caves is in 1960. For this inauguration they had to locate and rehabilitate the primitive access, which was sealed for thousands of years and thanks to which everything had been kept intact inside. Although I am not a fan of speleology in particular (the science that studies the origin and formation of caves), the caves fascinate me because of their age; they witness the passage of time and if they had consciousness, for them we would only be an instant in their existence. 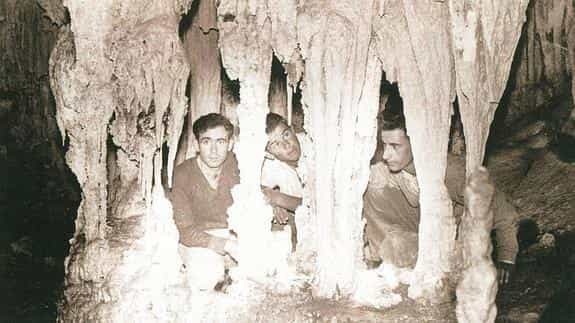 Did you know that the world’s largest stalactite is in Nerja? It is located in the Hall of Cataclysms and its age is about 450,000 years; much older than our recent history. The archaeological study of this cave is recent and is still active. Excavations and studies of the caves paintings demonstrated that this cave has been inhabited for more than 40,000 years, making it one of the caves where human presence has been present for a longer time. As a curiosity, monk seals, dolphins and fish such as gilthead breams, snappers and groupers are just part of the diet of those who occupied the caves. In addition, remains show the use of the caves as a burial-place since the end of the Neolithic. Among the main archaeological values of the Caves of Nerja we highlight its cave paintings. Of these we will find deer or even seals, all drawn with the charcoal of a burnt wood. According to a recent dating of organic remains found in the Caves of Nerja, researchers are considering new hypotheses about the antiquity of the oldest known artistic representation to this day. These drawings found in 1970, which supposedly represent seals, are thousand metres inside the cave. They are in a reduced space with restricted access, which can only be accessed with speleology equipment. 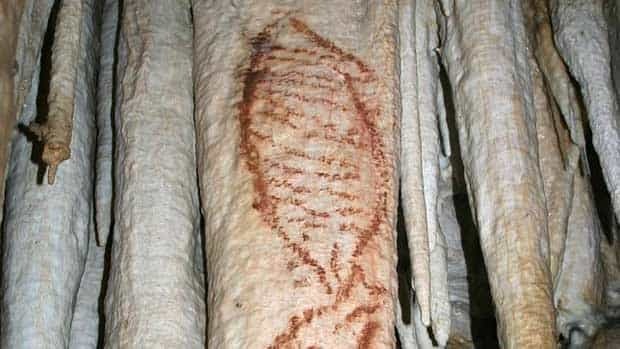 Cave paint with what looks like to be a seal. The organic remains found next to these drawings are between 43,000 and 45,000 years old and the hypothesis says the drawings could be of a similar age; a hypothesis that if verified would revolutionize the history of Palaeolithic art, since it supposed until now, that the Neanderthal man did not know art. These remains, however, although located close to the paintings, cannot be directly associated with them. If you decide to visit the Caves of Nerja, you will find several rooms open to the public. Many others are closed by now as those are places where archaeological research is still active. Discovered in 1969 with prehistoric remains that cannot be seen by the visitor. These recently discovered rooms cannot be admired by the visitor. The Cave of Nerja opens all year round. It only closes on 1 January and 15 May. The opening hours are from 9.30 am to 3.30 pm. Use of tourist bus-train that connects the Cave of Nerja with the museum at Plaza de España and Barco de Chanquete: 15€. *The price of the museum separately is 4€ for adults and 2€ for children between 6 and 12 years old. *Children under 6 years old have free entrance. Every year since 1960 the Caves of Nerja are used as a natural auditorium for the Festival of Music and Dance to commemorate its discovery. This activity takes place between the months of June and July, you can find the latest information on concerts in the Caves of Nerja following this link. You can get to the Nerja Caves by car using the A-7 motorway in the direction of Almería. Take the exit signposted “Cueva de Nerja”. It is very easy to get there from Marbella, Fuengirola, Benalmádena, Torremolinos or any other place from western Costa del Sol. Another option is to use the bus line that connects the centre of Malaga with Nerja and Maro. You can check the options above and others like using a taxi transfer in our guide for getting from Malaga to Nerja.